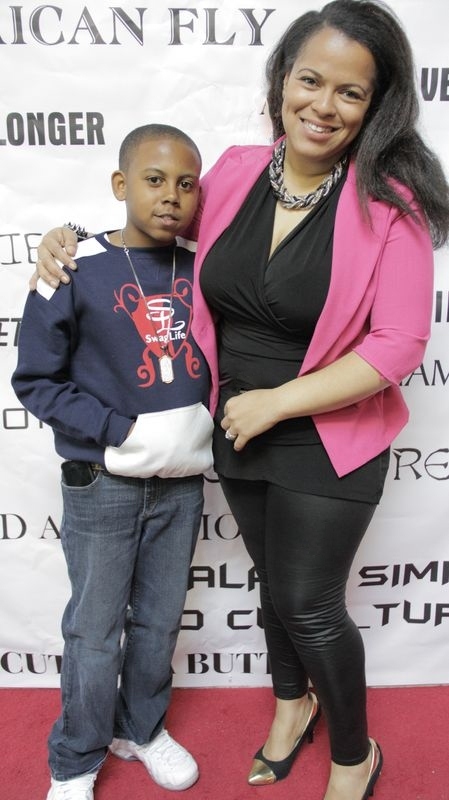 On Saturday April 6, Fresh Kid Nation covered the Chase Kid Fashion Fair at Sanders Studio in Brooklyn, NY. I had a blast hosting the red carpet with my friend DeMarius of Champ Media! We met tons of kids with swag and brilliant designers ready to celebrate with Chase for his second birthday. 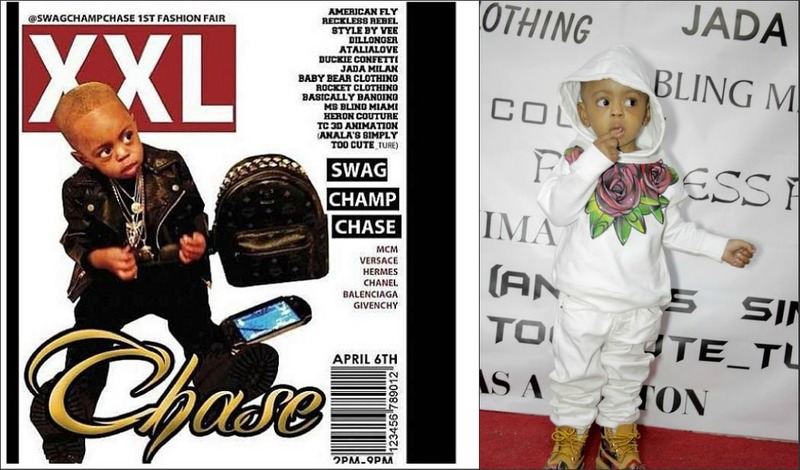 Baby Chase arrived in style rocking a custom white hoodie and boots by Delano Brown. The guests arrived dressed to impressed and excited to meet representatives from the children’s clothing brands. Power 105 radio host Angela Yee arrived early in the afternoon to greet a few designers. Reckless Rebels, American Fly and Heron Couture are boy’s fashion brands that displayed bold t shirts, graphic sweat shirts and fresh fitted caps at the event. Swag Life clothing was created by 13 year old designer Lloyd with the help of Scoop. Domonique from Mi Bella Vita and of Ka’ress My Lyfe Clothing sisters from Ohio, featured custom t shirts and jackets for boys and girls. They guarantee that 20% of all proceeds go towards the Lupus Foundation. 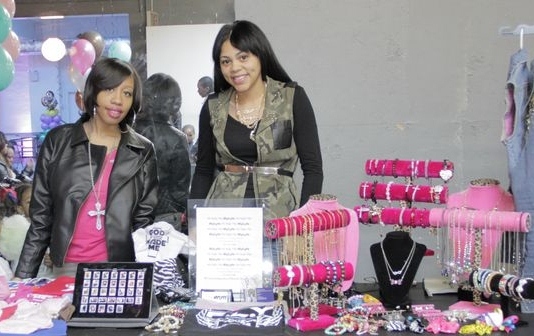 Local Boutiques Polka Dots and Rockets located at 2216 Fulton st in Brooklyn as well as You Me and Dupri hosted pop up sales for guests. I also met designers from Pascale’s House of Bling Atalia Love Dillonger and Duckie confetti. The Kids and adults were treated to yummy cotton candy, fresh popcorn, and face painting provided by Say Cheeze entertainment. The evening ended with kids walking on stage showing off their cool outfits. We also have exclusive video interviews from the event that will be online soon! This entry was posted in Boys Fashion, Celebrity, Events, girl fashion, style and tagged American Fly, Angela Yee, Atalia Love, Black Designers, Boys clothing, Brooklyn, champ media, children's clothing, children's fashion, Delano Brown, dillonger, duckie confetti, Fresh Kids, girls clothing, Heron Couture, ill Dilly, Ill Dilly Jada Milan, jada milian, JQ by Julius Q, Kids fashion show, kids stylist, Mi Bella Vita, Ms Bling Miami, My Lyfe clothing, Pascales house of bling, polka dots and rockets, Sanders Studio, shauna carr, Style by Vee, Swag, Swag Champ Chase, Swag Champ Chase Kid's Fashion Fair, swag life clothing, The Gossip Game, The Reckless Rebels, tutus, VH1, yeahlano, you me and dupri. Bookmark the permalink.